Succeeding Globally Through International Education and Engagement (revised in 2018) outlines the U.S. Department of Education’s International Strategy and affirms the Department’s commitment to preparing today’s youth, and our country more broadly, for a globalized world, and to engaging with the international community to improve education. Help individuals find meaningful employment. Foster an informed, engaged and active citizenry. Enhance the country’s economic competitiveness. Strengthen our national security and diplomacy. Support relationships with peers around the world. The U.S. Department of Education’s updated international strategy reaffirms the Department’s commitment to preparing today’s students, and our country more broadly, for a hyper-connected world. It reflects ongoing work in implementing international education programs, participating in international benchmarking activities, and engaging allies and multilateral organizations in strategic dialogue. The initial international strategy, upon which this updated strategy is based, was developed through extensive consultation within the Department, as well as with other U.S. government agencies and nongovernmental organizations. Since the strategy was first established in 2012, it has been used to guide the Department’s international activities and engagement. The Department’s international strategy is integrated with the Department’s domestic agenda and designed to simultaneously attain two strategic goals: strengthen U.S. education and advance our nation’s international priorities. 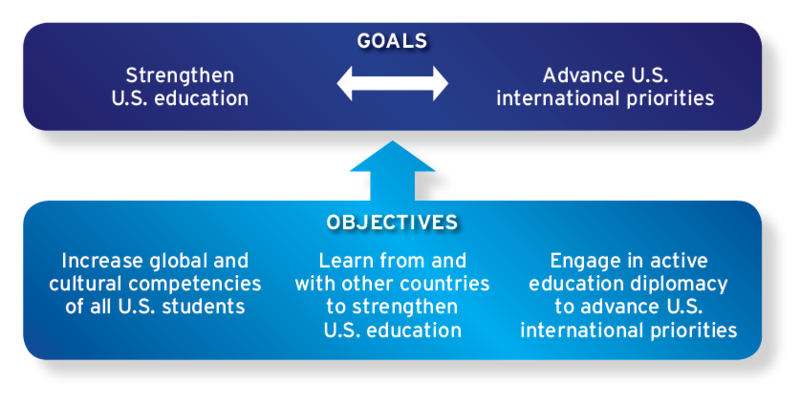 As illustrated in Figure 1, three interrelated objectives—increase students’ global and cultural competencies, learn from and with other countries and engage in education diplomacy—will advance the Department’s larger strategic goals. The activities supporting these objectives are undertaken by program offices across the Department and, in some cases, in cooperation with other U.S. government agencies, including the State Department, U.S. Agency for International Development (USAID), and the Departments of Labor and Commerce. Underlying the strategy is the notion that advancing educational achievement and increasing economic viability, both domestically and internationally, are worthy pursuits. Thus, in implementing the international strategy, the Department will continue to build awareness of the importance of a world-class education for every student, international relations and cross-cultural exchange. The Secretary and other high-level Departmental officials will continue to address these issues in speeches, publications and other communications. Click on Objective 1, Objective 2 or Objective 3 for additional information.